- To log-in or create a customer account. - To book your first stay ! 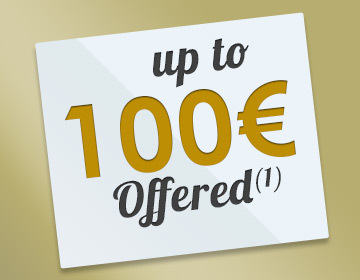 At the opening of sales for the next season, you will receive a gift voucher of up to €100 ! Earn an annual gift voucher! Your loyalty is rewarded from your first stay. To win gift vouchers, simply stay with Homair(1)! Each year, at the opening of sales for the next season (October-November), you will receive a gift voucher whose value depends on the number of past stays with Homair. How to use your gift voucher ? When booking by phone, you can simply tell your advisor you wish to use your gift voucher. 0 844 369 00 03 (cost for a call to 0844 + 0,05£/min) or on +33 442 168 990 from abroad. Introduce your friends and family and receive gift vouchers! 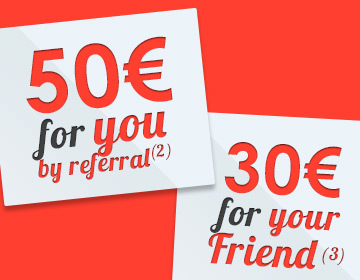 Receive €50 by referred friend ! The more friends you refer... the more you will receive gift vouchers ! 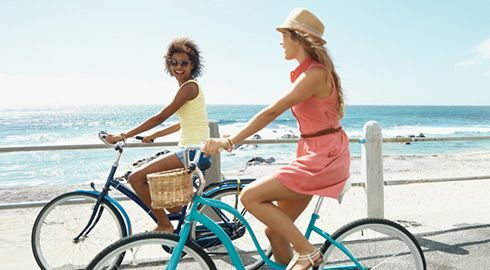 Your gift voucher works like a savings account which is credited with €50 at each end of stay of your referred friends. It's easy to join in. - Go to your customer account, click on "Introduce a friend"
- Fill in the names, surnames and email addresses of your friends and confirm the information. The day after the creation of his customer account on www.homair.co.uk, your Friend will receive an email containing his gift voucher. He simply has to book his first stay on www.homair.co.uk and write his gift voucher when booking in the box "Gift code" or contact one of our advisors on 0 844 369 00 03 (cost for a call to 0844 + 0,05£/min) to book his stay and provide his gift voucher (available for a minimum of 7 nights). fter your friend's first stay, you will receive an email containing your gift voucher. You simply have to book your stay on www.homair.co.uk and enter your gift voucher when booking in the box "Gift code" or Contact one of our advisors on 0 844 369 00 03 (cost for a call to 0844 + 0,05£/min) to book your stay and provide your gift voucher (available for a minimum of 7 nights). (1)Your gift voucher is calculated according to your stays completed from 2009 included. It is usable in one time, for the current season, on every campings and except on camping pitch​. A gift voucher cannot be combined with another gift voucher. Offer valid for any stay booked and paid for directly with Homair and not using any other special offer. (2) This gift voucher will be automatically credited to your Friend's account the day after they set up their customer account on the Homair website using the referral e-mail. (3) The gift voucher will automatically be credited at the end of your Friend's first stay of 7 nights or more. It is usable in one time and for a leng​th​ of 24 consecutive months from the reception date.​ In case referrer ​combines gift vouchers from several friends, the validity length is recalculated from the last received gift voucher. 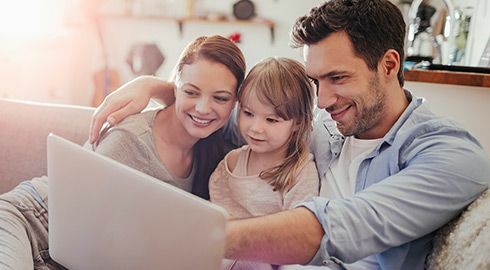 Customers or family members (with the same surname and address) who have already stayed at Homair or who already have a customer account cannot be introduced as a Friend. (4) Can only be used once and for the same stay.